Sergio Marchionne during press conference: "The infrastructure is here” to increase volume at the suburban Detroit assembly plant. DETROIT -- Chrysler Group's Sterling Heights Assembly Plant, once scheduled for closure at the end of 2012, could become Chrysler's biggest plant in terms of output -- possibly even making Alfa Romeos, Chrysler CEO Sergio Marchionne said today. “I wouldn't be surprised to see an Alfa” come off the line at Sterling Heights, Marchionne said. Alfa Romeo is scheduled to return to the United States in 2012. The Michigan plant currently makes the Chrysler 200 and Dodge Avenger mid-size sedans, Chrysler's entries into the industry's largest segment. Rivals include the Toyota Camry, Honda Accord, Ford Fusion and Chevrolet Malibu. “The infrastructure is here” to increase volume, said Marchionne, speaking at a ceremony Monday to announce $850 million in new investments at the plant, including a new paint shop. Chrysler is adding a second shift at Sterling Heights in February with 900 new workers. The Sterling Heights plant, located 23 miles northeast of downtown Detroit, now employs 1,270, including 1,158 hourly and 112 salaried employees. The 200's predecessor, the Sebring, and the Avenger had performed poorly in the segment. Chrysler's previous owners, Cerberus Capital Management, had mothballed plans to give the two cars a mid-cycle facelift. Cerberus had also scheduled Sterling Heights for closure at the end of 2012. Shortly after Fiat S.p.A. assumed control of Chrysler when the latter emerged from bankruptcy in June 2009, Marchionne resurrected plans to revamp the cars. The 200 and Avenger, which recently started production, are scheduled to appear in showrooms this month. 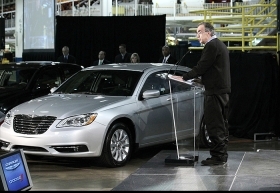 Chrysler announced the plant would be open beyond 2012. Chrysler engineers and designers made significant changes on the two cars including new interiors, a new V-6 engine offering and an extensively retuned suspension. Also speaking at the ceremony, Michigan Gov. Jennifer Granholm called Sterling Heights the "Lazarus plant" for its comeback from scheduled closure. On another matter, Chrysler may repay its U.S. and Canadian government loans before 2013, allowing Fiat to take a 51 percent stake, Marchionne said. “It's one of the options that we're looking at,” he said. Fiat, which holds 20 percent of Chrysler, has said it will increase that stake to 35 percent next year by achieving milestones outlined in the automaker's restructuring last year. Marchionne has said he will probably take Chrysler public during the second half of 2011. The CEO has also said he wants to improve Chrysler's capital structure before the IPO and that it may include refinancing the automaker's U.S. and Canadian government loans, which have effective interest rates as high as 20 percent. Interest payments have kept the company from posting a net profit, he has said. Repaying those loans would allow Fiat to exercise an option to buy an additional 16 percent of Chrysler's equity and raise its position to a 51 percent majority. Fiat may save as much as $2 billion by doing so before holding an initial public offering of Chrysler stock, Barclays Capital said last week in a note, whose lead author was Kristina Church, an industry analyst. Fiat can't raise its position beyond 35 percent until 2013, the automaker has said. It may be possible for Fiat to take advantage of the 16 percent option before 2013 if it pays off the government loans first, Church said. Fiat executives have been travelling Europe on a roadshow for the spinoff of its heavy truck and tractor business, Fiat Industrial SpA. The reduction of Chrysler's interest cost and creating a stable capital base is more important than increasing Fiat's ownership stake, Marchionne said. “My option is not going to die tomorrow,” he said. Prices for the Chrysler stake are based on multiples of earnings before interest, taxes, depreciation and amortization, or Ebitda. “Fiat has the option to acquire another 16 percent of Chrysler for a multiple, if it is pre-IPO, that does not exceed Fiat's own multiple -- which after the spin-out and a potential sale of Ferrari is likely to be well below that of U.S.” peers such as Ford Motor Co., Church said. Fiat has leverage to encourage such a scenario through its ability to delay the Chrysler IPO until after January 2013, Church said. “If any of the non-Fiat stakeholders want to see an IPO prior to 2013, Fiat could require them to consent to a refinancing and repayment of the government loans to allow Fiat to exercise its option,” Church said.